Apple's making it easier than ever to get you where you need to go - and, no, not by improving its own baffling Maps app. The company, following an apology earlier Friday by CEO Tim Cook for Apple's much publicized navi-snafu, has bundled a bunch of third-party maps apps in the App Store, placing them all under a "Find maps for your iPhone" umbrella. 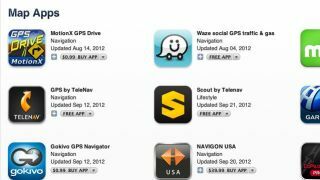 Click on the iTunes Store too and users will also see 13 Maps apps, from the free MapQuest app to Gokivo GPS Navigator ($0.99) to Magellan RoadMate USA (US$49.99, UK £30, AU$48). Cook, while urging users to give Apple's Maps time to mature, also suggested they download apps from the App Store like Bing, MapQuest, and Waze. He also recommended using competitors Google or Nokia maps via their websites "and creating an icon on your home screen to their web app." Apple.com's also featuring a "How to add a website icon to your Home screen" step-by-step so users can pin Maps web apps by Google and Nokia to the iOS home screen. For now, many of these apps don't have iPhone 5 display support, though with no end in sight for Apple's geographic challenges, that could change fast enough.